Protected zones are declared for 9 fragile and highly significant historic shipwrecks. It is an offence to enter, anchor, fish, trawl or dive in a protected zone without a permit. 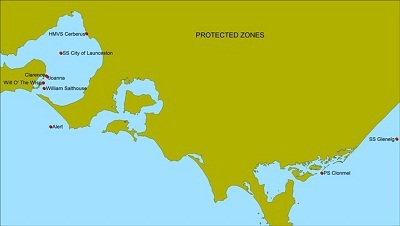 People found within a protected zone without a permit can be issued with on-the-spot fines of over $295 and multiple fines can be issued if more than one offence is detected. If prosecuted, people may be issued with fines of more than $7000. All shipwrecks 75 years and older are declared historic under State and Commonwealth legislation. Historic shipwrecks are fragile structures that often have weakened and vulnerable hull remains due to their long submersion underwater. Anglers are allowed to fish near historic shipwreck sites that aren't in protected zones. However, anglers should be careful about placement of their anchors (and also weighted shot lines) because it is illegal to interfere with, damage or destroy historic shipwrecks and their relics and severe penalties apply.